I bet you can tell by the name I have no originality on naming things. I am lucky my kids have names (my wife's family, her dad calls all the kids by numbers. My wife is number 1, any idea which birth order she is in) Any way I need a better name. Until something better comes up (and I really could use a suggestion) Hearts and Flowers 2? Not original but hey my wife likes hearts and flowers and she picked the pattern. I forgot to take a picture of the back of it to show off the roses, but it also has flowers. The squares on the back I bougth for the back of my lap quilt, but my wife tells me its too girly so it went on this baby blanket. This will be a gift for baby that will be born soon. Won't say who yet, to not spoil the surprise. The picture on the right was taken before we washed and cut the quilt the one on the bottom was after it was washed twice I believe. Very cute quilt. The more it is washed the more it get the edge you are looking for. 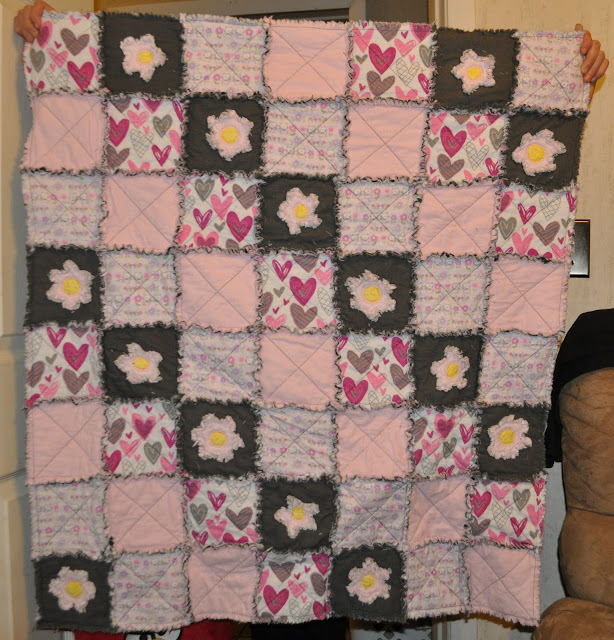 This is one of my favorite types of quilts to make. When I have some spare time. i see in the photo at the top of your blog that you have a walking foot on your machine. do you use this at all times? 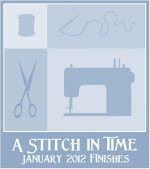 the only time i use my walking foot is when i'm quilting straight lines, not when i'm piecing or anything else. just curious. Wonderful job! That lucky baby will be so warm and cozy. I don't name every quilt, either. 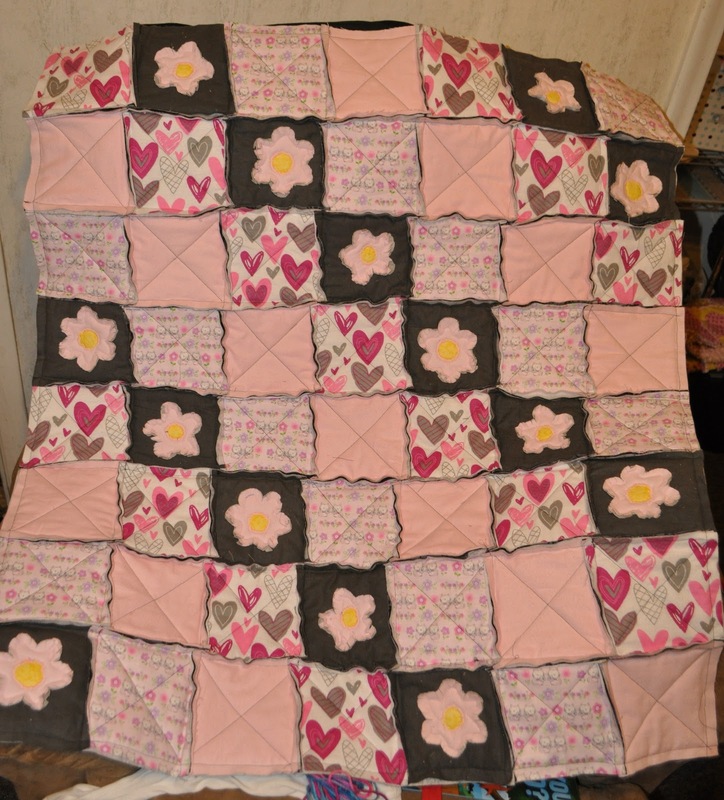 Sometimes a name just doesn't come to me, and the baby quilts I make as gifts usually end up with the baby's name. lol Keep up the great work! I am scrolling through your posts and think you are a riot!! Thank you for making me laugh. I applaud you on your quilting - you're doing a grand job! Good job! It's very pretty. 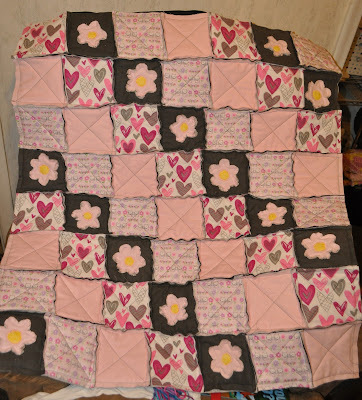 oh, I like this one : ) What a cute quilt! Love it! And Hearts & Flowers is a perfectly great name! Congrants on ANOTHER finish! Wow! Beautiful job!